The main screen is the central navigator for the program. Here is also where you set Local vs. GMT and Real Time vs. Fixed Time display modes. All functions are realizable using the standard Windows menu bar at the top of the screen. In addition command buttons provide a somewhat more convenient access to often used displays and functions. Hold your mouse cursor over the graphical status bar buttons to reveal their functions. 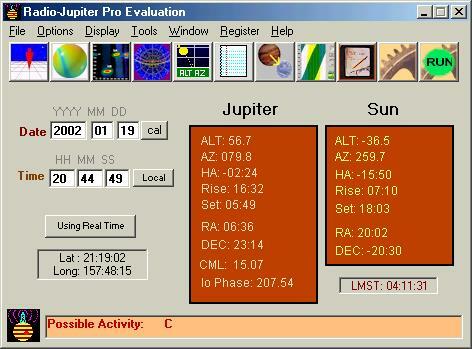 In addition to these launching facilities real time position information exists for Jupiter, Io, and the Sun at the left of the screen. A sidereal clock is also provided for enquiring minds who want to know such things. A status bar appears at the bottom of the main screen. The status bar sometimes and gives clues about steps to take. It also shows current Jupiter events that may be occurring and provides feedback on the progress of automation activities. The File menu has sub-options for loading and saving Mode Files and the much encouraged smooth Exit.